"Heritage architecture, contemporary design and botanical splendour." 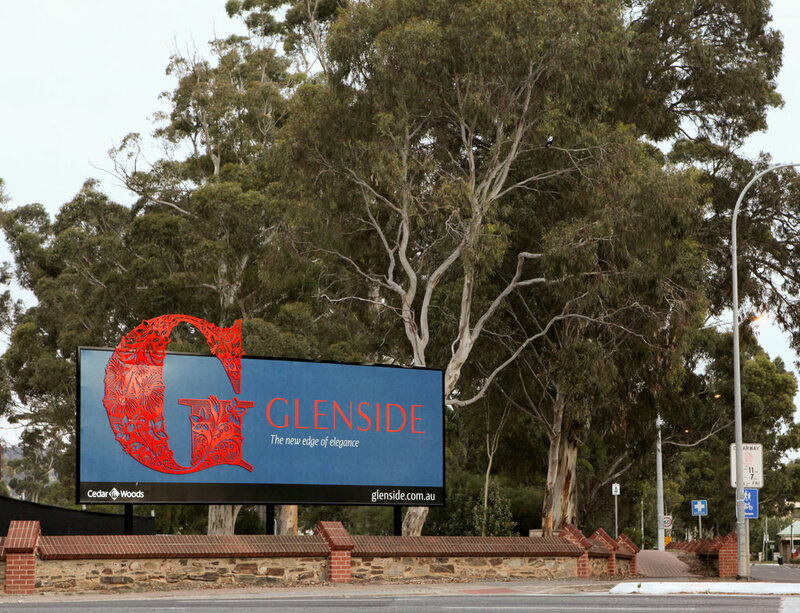 I designed an ornamented G motif as part of an exciting new identity for the Glenside residential redevelopment in Adelaide. I worked with Martins Brand House who played a major role in the rebirth of the large area in the heart of South Australia’s capital city. The G draws on the site's existing natural botanic beauty and historic significance. It references the existing Victorian buildings and the variety of native plants on site, striking the perfect balance of old and new. The species decorating the G are Blue Gum (Eucalyptus leucoxylon) and Golden Wattle (Acacia pycnantha) flowers , both of which are endemic in South Australia, together with Calytrix flowers. One of the 3 meter high, CNC cut Gs at the entrance to the new development. A few examples of the fantastic identity work from Martins Brand House using the motif.